Basketball (plain) is a popular sport machine. Two versions are available - standard and matrix. Basketball standard is cheaper version, it is equipped with simple display and is less equipped than the more expensive brother. The machines differ in results recording option and sound-illumination effects, which in Matrix version are presented on LED display. However both basketballs have possibility of linking up to 9 machines and the rim moving horizontally. The outdoor basketball fans shall not be disappointed as the machine is totally waterproof and it is not necessary to hide it under a roof. 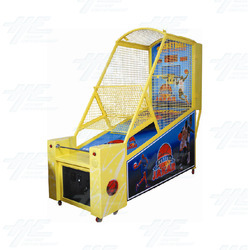 The Basketball strength machine is the amusement machine designed for indoor and outdoor use in amusement parks, fairs, pubs, cinemas, etc.